The bottoms of the spindle shafts should point ahead slightly, on both sides of the front axle. The right side looks like it is pointed behind in your pic, I'm not sure if it is, or if it is just the pic. The angle should match the left side, assuming it is good. 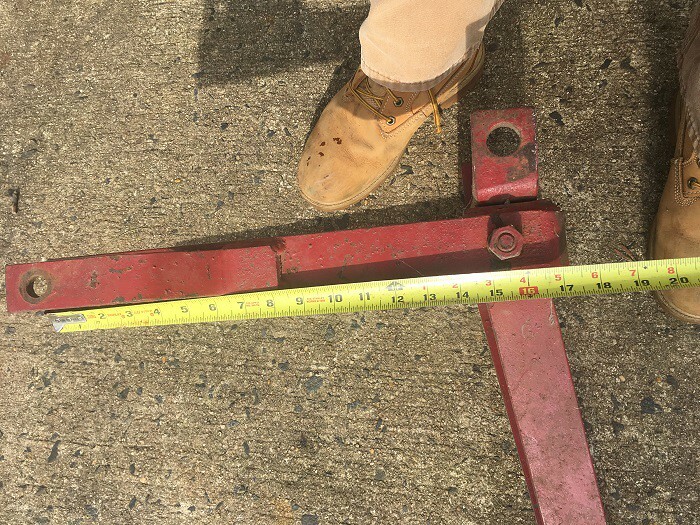 If needed, you need to jack up the front axle slightly, and loosen the axle width adjustment clamp on the right side, and try to pull the front wheel ahead, and turn the adjustable part of the axle in the center part of the axle. Cub being run with the clamp loose, in the past. The holes could be wornout too. I can't tell without being there. Below are pics from TM Tractor of how the pin should look, it is a snug fit in the hole. It looks like the left tie rod is moved out to the 3rd notch, and the right tie rod is all the way in. Both sides need to be out to the 2nd notch, with the axle out to the 2nd hole on each side, like it is in the pics. Below is a pic of the adjustable part of the front axle, the shaft going down the the wheel hub is the spindle shaft. Pic from TM Tractor. Thanks for the help everyone. Looks like a rainy weekend ahead, maybe I’ll get her all straightened up. If you find a wallered axle hole, you can weld it up and re-drill. Or, set your axle in or out to a less damaged hole, then reset your tie rods. Have fun on your rainy weekend. As to your L 54 on a standard Cub, I think I would investigate adding extensions to the front hangers. That would improve the angle of the plow to the ground and give you some room to better operate your crank. 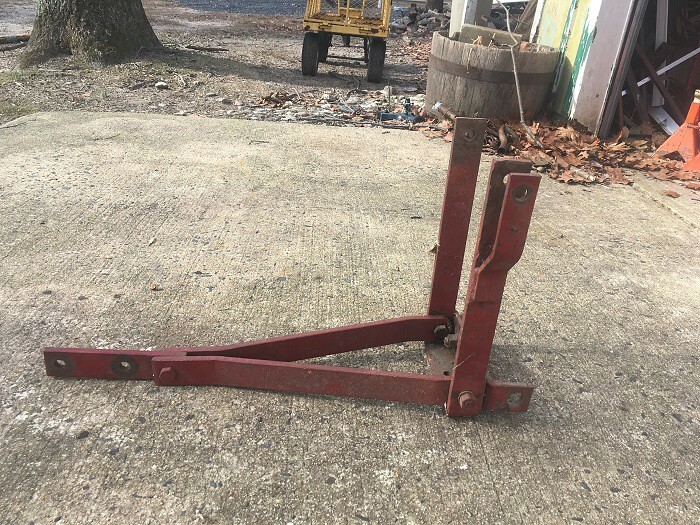 RJ, I figured I’d throw this out there again, I have a hanger assembly for a standard Cub that would mount your plow where it needs to be. If you want I’ll swap it out for your lo-boy assembly. No money exchanged, a straight swap so you have what you need. This way you don’t have to reinvent the wheel. Ps- I’ll be going right past you at the end of May on my way to Barnyad’s Bash. I can hookup with you to make the swap so no postage involved either. PSS- I took a walk out to the barn and dug it out. It's in perfect condition. Lt.Mike wrote: I have a hanger assembly for a standard Cub that would mount your plow where it needs to be. There are three components that make the difference between an L-54 and a 54A. The lifting lever, the pressure spring assembly and the axle hanger. I'm not sure how changing just one of these components will affect the working geometry of the blade. If it were me, I would keep the original components together. Just my opinion. Agree with Don, some people like the Loboy plow on a regular Cub because of the extra lift. The longer loboy lift arm will not lift the blade as high while the shorter spring rod assembly will lift higher. The hanger assembly would be my only concern as a loboy assembly on a regular Cub does not provide the intended flat push into the load. The plows frame should be parallel to the ground. Angling it downward is putting the force of the load up into the bolster instead of back into the torque tube. Hit that crack in the driveway and you might end up cracking the bolster. On the lift arm I’m actually using the shorter one from a regular Cub on my Loboy and it provided an additional 2-3” of lift on the blade. Your offer is very tempting. I’m just not quite sure I want to separate the pieces of the L-54 that I have. I might want to buy that bracket though. As for my axle issues. Standing over the cub right now it looks like bother wheels are set behind the axle equally (despite what the pictures show). I’m thinking the axle is in there backwards. Like the right side ought to be in the left. Looking under the tractor it seems set farther forward than in other peoples pictures, which supports my assumption because if you flipped it around it would be farther towards the rear of the tractor. My question is, hows it come out of there? If I just loosen those clamps I can’t believe they’d open wide enough for it to come out. The easiest way I know of to ensure the axle is installed correctly is the grease fitting for the pivot pin should be on the right, behind the axle. 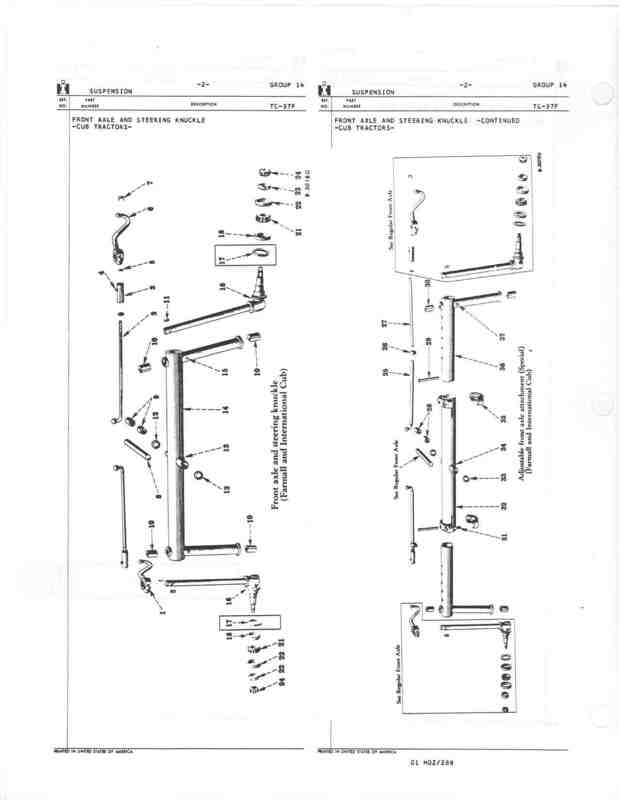 And if I got this right, here is a section of the service manual regarding removal of the front axle. 1. Previous owner may have driven the pivot pin in with a hammer, resulting in some mushrooming of one end. Take a look at both ends, and don't try to drive a mushroomed end out...drive it the other direction. 2. Use a brass drift to drive the pin in and out, to avoid adding to any mushrooming. 3. Make sure you DEFINITELY have the little divots in the pin oriented correctly to allow the bolts to be reinserted without messing up their fine threads. There is almost no way to turn that pin once it's installed. 4. Don't forget to reinstall any needed bushings/spacers when inserting the pin. BTDT! Requires pulling it out again! Last edited by Dale Finch on Sat Feb 10, 2018 11:46 am, edited 1 time in total. It would have to be a swap as it is now part of a complete setup. I have other local Cubs that I help keep running that the setup may go to someday and my neighbor has 2 loboys that it could go to. I think you nailed it. Look at his photo from the side that I asked him to take. Axle is not directly under the steering gear housing. Look where we wedge the axle to stabilize the front when lifting. The pivot is shorter to the front than the rear. The grease zerk is on the right rear in the correct orientation. My Grease zerks is up and on the left, so the axle is upside down, not backwards as I originally suggested. That makes perfect sense. Everything I’ve tried taking apart so far moves very easily. So it should not be overly difficult for the rest. I can’t remember exactly when this was taken apart last. 15 or so years ago. This will be great to get fixed up, because as it is when you turn a certain way it hits the caster wheels of the woods deck. This will solve that issue completely. 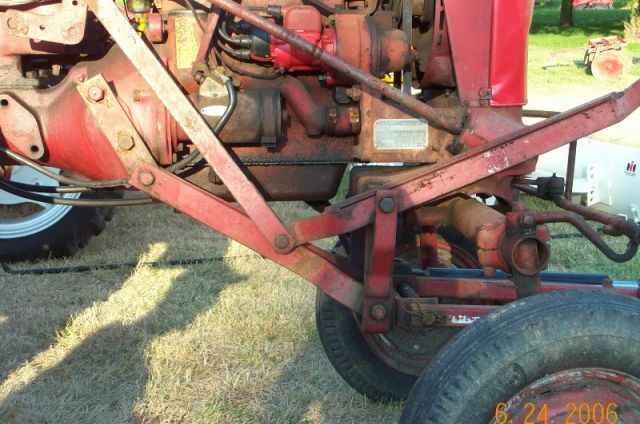 I guess you probably figured out from what Dale posted that the front axle is held on by a large pin, or shaft in the center, it slides out to the front or rear after removing the 2 bolts at the ends of the shaft. When putting it together, it is easier to jack the front end to just the right height, then the shaft is easier to align, when it is just the right height. There should be a thick washer at each end of the shaft, be sure to put them back in when assembling the axle. They are numbers 12, and 33, in the pic below. If you have the axle out, it is a good time to check the 2 bushings in the axle for the pivot shaft, if they are worn, they are replaceable. They are number 28 in the pic below. 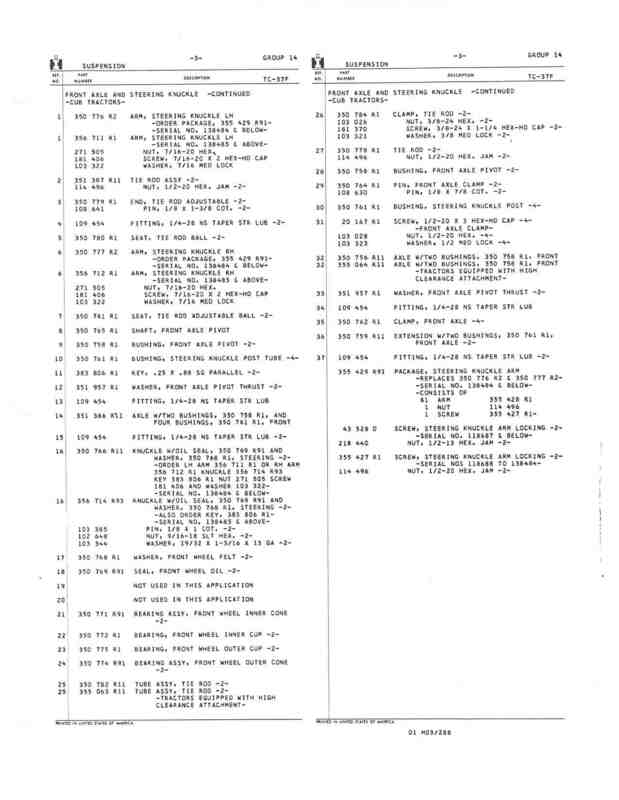 Below are pages from the Cub parts manual, if you need them. Last edited by Glen on Sat Feb 10, 2018 8:18 pm, edited 2 times in total.